Get to the bottom of your problems with damp with a professional damp survey in Chandler's Ford carried out by a specialist member of our team. Our team of damp experts are fully qualified and have years of experience identifying and treating all types of damp for both commercial and residential clients in Chandler's Ford. When choosing a damp survey with Croft Preservation, you don’t just benefit from a fully detailed report but have access to our industry leading knowledge as well, so you can guarantee exceptional service. If you require a property inspection for your home or commercial establishment in Chandler's Ford, don’t hesitate to contact our damp specialists today on 01202 737739 to arrange a time and date. We operate a total honesty policy when carrying out a damp survey in Chandler's Ford for you, which means that if we believe there is an easy and effective fix for your damp problem, then we will always let you know the most cost-effective solution available. 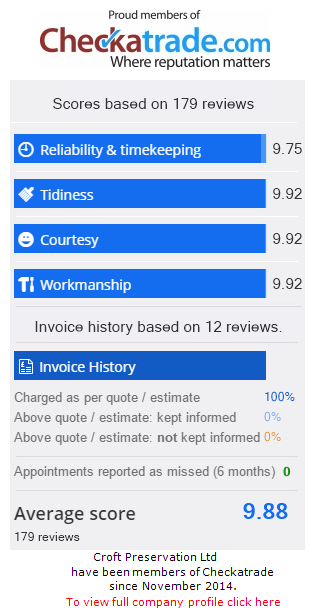 Our pricing is always transparent, so you can rest assured that there are no hidden costs when undergoing a Chandler's Ford damp survey with us. Our Chandler's Ford damp survey reports are created using the latest diagnostic techniques and only suggest the most up-to-date treatment methods if required. They are laid out in simple, plain English with no industry jargon or hidden agenda. Any potential issue will be clearly listed along with the suggested solution, meaning you can see exactly why and how we plan to tackle your damp problem. A Chandler's Ford damp survey from Croft Preservation is the best way to guarantee a reliable answer to your problems with damp. Our damp experts will not only identify the source of damp but provide you with expert advice and damp treatment too! Contact us on 01202 737739 to arrange your damp survey today. Contact us today to arrange your professional damp survey in Chandler's Ford! A damp survey in Chandler's Ford carried out by our qualified damp experts is the best way to ensure that your damp problem doesn’t become even more damaging to your home. We are here to help! Contact our team on 01202 737739 to arrange a quote and suitable date and time for your damp survey.